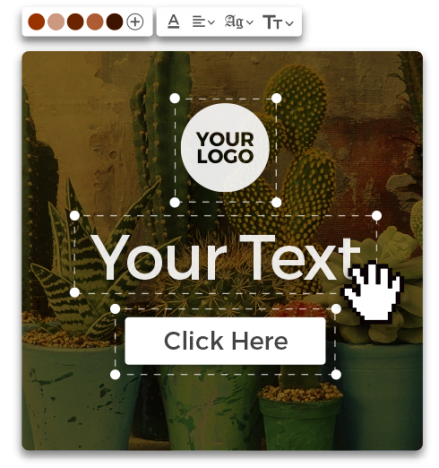 Design your own Instagram profile picture, Instagram photos, and all the images for your social media accounts with Postcron ArtStudio: the effortless Free Image Creator. Make the most out of your brand presence on Instagram by sharing quality images in the right size. Create images for Instagram that reflect the spirit of your brand, without worrying about the quality and optimized size. Postcron ArtStudio will take care of that for you!. Select this template to create the perfect Instagram profile picture, following the correct dimensions and other Instagram specifications. Create images for your Instagram Stories using the correct measures so they can be properly displayed on all devices. Ever since Facebook bought Instagram back in 2012, this image-centered social network hasn’t stopped growing. Its several users around the world multiply everyday, reaching 800 million monthly active users in 2018. That is why it's so important to step up your Instagram game! Whether you want to promote your brand, business or products, or simply get more followers: don't miss out on this posts. We'll show you how to use images on Instagram, what's the recommended size for each of them and show you tips you need to apply to rock Instagram! How Many Times per Day Should You Post to Instagram? So you've created an Instagram profile and are ready to start working on it. Good! Now, how should you go about doing this? Let's start off by knowing how often you should post to Instagram, given that every social network has its own recommended posting frequency. It’s highly recommended that you post at least once a day, but two times a day would be the ideal publishing frequency. 🕐 Between 3 PM and 4 PM approximately. 🕐 Between 12:30 AM and 2 AM approximately. Which means that it’s super important for you or your brand to show up on your audience's feed exactly when they are checking it for worthwhile content or before bedtime when insomnia kicks in. What Are the Recommended Image Sizes for Instagram? While you would normally take photos with your phone to share to Instagram, every once in a while you might have to upload photos from other sources. That's when using recommended Instagram photo sizes will come in handy. Why? Because your photos will look much more attractive! • Instagram Profile Picture: 400x400 pixels. • Instagram post (Standard): 1080x1080 pixels. • Instagram post (Landscape): 1080x566 pixels. • Instagram post (Vertical): 1080x1350 pixels. • Instagram Story: 750x1334 pixels. • Instagram Ad (Square): 1080x1080 pixels. • Instagram Ad (Landscape): 1080x566 pixels. • Instagram Ad (Vertical): 1080x1350 pixels. What Type of Content Should I Publish to Instagram? We all know that Instagram's main purpose is sharing photos. But every new feature brings us endeless new possibilities. That’s why we want to make sure you know what's the best content to share! Photos are the base of your posts. Once you’ve defined your audience’s profile and likes (corresponding with your brand and proposal) you can start to publish photos from your day-to-day life, your products, pleasing scenery, and objects. As we explained earlier, Instagram has some new features; Instagram Stories is the most prominent. It allows you to record up to 10 seconds videos and add fun drawings to each one. You should really take advantage of this and share the entertaining moments of your day. 3- Share Breathtaking and Attractive Posts from other people. Another way to share good quality content on Instagram is by reinstagraming other people's attractive and relevant posts to your community every once in a while. 4- Add Hashtags to Everything You Post! Even though this last one is not exactly a type of content, it's extremely important that all your posts come with a relevant hashtag in order to maximize their exposure. The idea is that when people search those hashtags your images appear as a result.